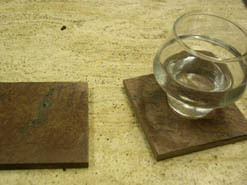 Just because you use drink coasters to protect your surfaces doesnt meen that they have to be corporate cookie cutter pieces that take away from the life and personality of the space. 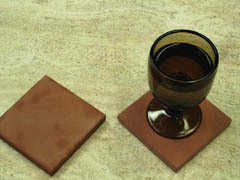 the following sets of coasters are all rugged, rustic, and individual with their own unique features and distinct sensibilities. Copper is a rustic natural stone, that features a variety of colors, red, gold, and silver tones, all of which collide in the face of the material to create a one of a kind masterpiece. 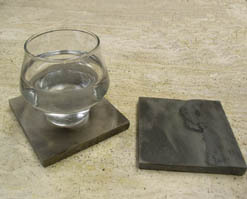 Natural slate is a moderately absorbant material that can take in the moisture from a wet glass, without becoming inundated or staining easily. The idea of rustic decorating is often an attempt to reconnect with nature, and the simplicity of the past. Within these drink coasters, we have a window into the past, with visions of million year old fossils prominently displayed in each one. 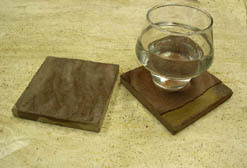 Soft dulcet tones of the earth wash wistfully across the surafce of these stunning rustic natural beverage coasters. Born in a mountain, rough, unformed, chaotic, the stone is refined into squares, and guaged to a level surface, which allows them to be used as attractive coasters for your home or office. Gold blush is a natural stone that is formed in the Himmallayan mountains, halfway across the world in India. 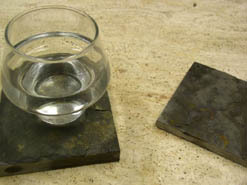 As it forms a complex cocktail of elements are present, each one lending to the eventual multicolored surface of the stone. Depending on placement of these elements, and how they combine and collide during the stones birth, the eventual colors and patterns seen in the stone can vary wildly. A thousand shades of darknes, all of the multi faceted layers of night merge and fall upon one another, dissolving into the dark before being once again resurected in a charcoal cloud, which is itself washed away into the oblivion of midnight. Gently gauged, rustic masterpieces of multiple darkness. 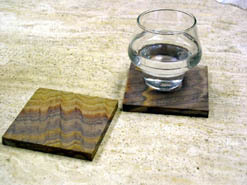 Multicolored layers of hue rush like a painted dessert across the face of the panther sandstone beverage coasters. Swirling in windswept patterns, these colors dance a merry step, adding light and beauty to the face of the stone. Meanwhile, the highly absorbent properties of the material ensure that your surfaces will remain free of nasty water stains. The surface of these rustic sandstone drink coasters is a wild array of colorful tones, all falling in bands of contrast and hue. Bright yellows merge with formal violets, red haze hints at the edges, and throughout pink and amber dance with one another in intriguing compliments. Deep red, the red of ruby's, the red of sunsets, this powerful and passionate tone is capture in the surface of these stone coasters, suspended in time for an eternity, the little shadows of its own contrast a haunting haze over the face of these rustic and highly absorbent home accessories. 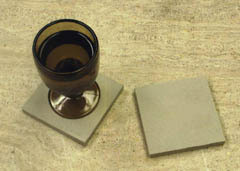 These coasters are made from real mountain born, imported natural indian sandstone. This is the same material found in boulders, towering mountain ranges, and the earth beneath our feat. 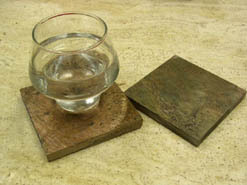 All natural amde of the earth, these drink coasters will add a primal, powerful spirit to any location where they are used. Powerful golden tones burst forth from a see of black, erupting onto the surface of the stone like a celebration, like an exhultation of freedom. These bright colors escape from the sundry bounds of their stony prison and are free, free to spread the glorious chearful tones of their mood across whatever environment they are placed in. 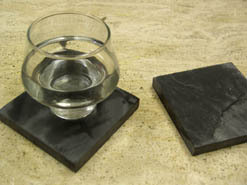 These rustic coasters are crafted from real, imported african natural slate. Multi china is a rustic natural slate that contains a rich variety of features. 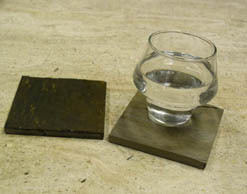 Breaking free of the stony surface of the material are hints of color, golds and amber hues, which gently color the face of the coaster. 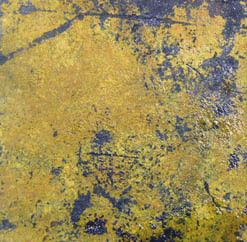 Meanwhile a richly dimensional surface has been guaged flat, leaving behind the graded impression of its layered past. The mottled red tones which do war with charcoal hues in the surface of these coasters gives the overall piece a distinctly rustic look. This contrast competition makes the material look more natural, and less perfect, giving each piece personality and distinct quality.